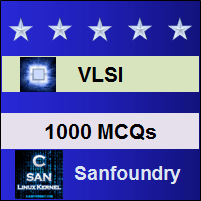 This set of VLSI Multiple Choice Questions & Answers (MCQs) focuses on “Scaling Factors -1”. Explanation: Microelectronic technology can be characterized by minimum feature size, number of gates on one chip, power dissipation, die size, production cost etc and not by designing cost. 2. Which model is used for scaling? Explanation: Constant electric scaling model and constant voltage scaling model is used for scaling. Explanation: α is used as the scaling factor for linear dimensions where as β is used for supply voltage Vdd, gate oxide thickness etc. Explanation: For constant voltage model, β = 1 and 1/β is choosen for the scaling for all voltages. Explanation: For constant voltage model, β = α. Explanation: Gate area Ag can be given as the product of length and the width of the channel. Explanation: Gate area is given as the product of length and width of the channel and it can be scaled by 1/α2 . Explanation: Gate capacitance per unit area is scaled by β and this is given by €ox/D. Explanation: Parasitic capacitance is given by Ax/d where Ax is the area of the depletion region and d is the depletion width. Explanation: Parasitic capacitance is scaled by 1/α because area is scaled by 1/α^2 and d by 1/α. Thus (1/α^2)/(1/α) we will get 1/α.